After an absence of some 300 years wild boar are present in England once again. Coming across wild boar or their signs is likely to be a new or uncommon experience for many people and landowners and managers may have to become used to the presence of wild boar on their land. In 2008 the Feral wild Boar in England action plan was published by Defra. The plan describes Government policy regarding wild boar, one of its requirements is that a range of authoritative advice relating to wild boar be published. 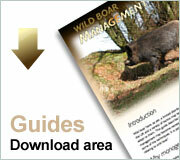 This website contains six guides relating to different aspects of wild boar biology, ecology and management.